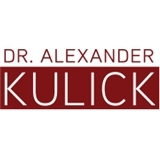 Alexander Kulick MD PC (New York) - Book Appointment Online! Dr. Alexander Kulick utilizes extensive range of treatment options focused on an alternative approach to pain management in NYC. His focus is on both the physical progress as well as the emotional well being of his patients. His state-of-the-art clinic offers relief treatments as well as education to patients with acute and chronic pain. Patients receive an independent medical evaluation from the doctor, an analysis of their pain syndromes and a treatment solution tailored to individual needs. We work with most commercial out-of-network insurance policies including Oxford, United Healthcare, Empire Blue Cross Blue Shield, Cigna and Aetna. Please call the office and speak with the practice manager, Heather, to verify your coverage. Dr. Kulick has provided me with outstanding expert attention to a complex pain issue. From our very first meeting I knew he was listening and truly wanted know my health history. His scholarly persistence and attention to my specific concerns are above and beyond what I have experienced with most any other practitioner.